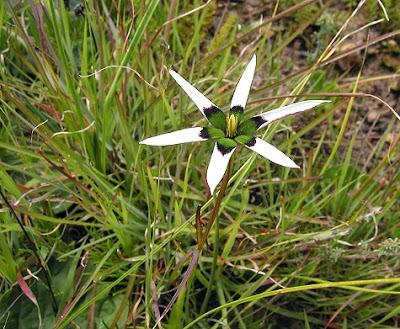 Common star-grass Hypoxis hirsuta, photographed by Merel R. Black. 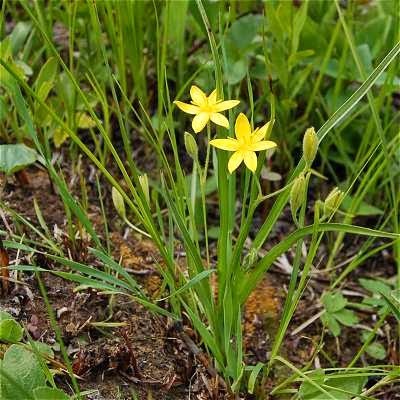 It does not require a great deal of insight to understand why the plant pictured above has acquired the vernacular names of 'star-grass' or 'gold-star'. This small native of North America is one of the few representatives in that region of the family Hypoxidaceae, a group of about 150 species of thin-leaved monocots that is most diverse in the Southern Hemisphere, particularly in Africa. Most Hypoxidaceae are small like the North American gold-star, though the Asian hill coconut Curculigo latifolia may be over a metre in height. All grow from underground corms or rhizomes. Their flowers have the typical monocot arrangement of three sepals and three petals, and are most commonly yellow to pink in colouration. They mostly produce little scent (some have a faint sweet scent), and usually attract pollinators by offering pollen as a reward. Some species are grown as ornamentals, but for the most part the Hypoxidaceae are not that significant economically. 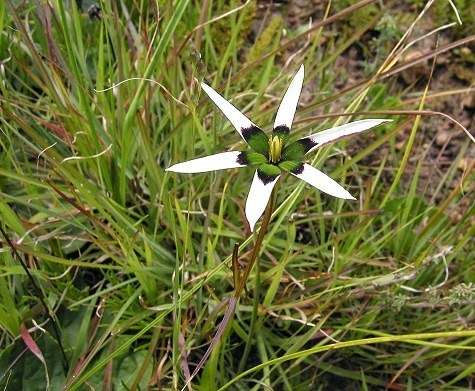 The tubers of the African potato Hypoxis hemerocallidea (which, despite its vernacular name, does not seem to be eaten as a vegetable per se) have been used to make a medicinal tea; it has become particularly widely used in recent years to supposedly alleviate the symptoms of HIV, but tests of its actual efficacy remain in progress. 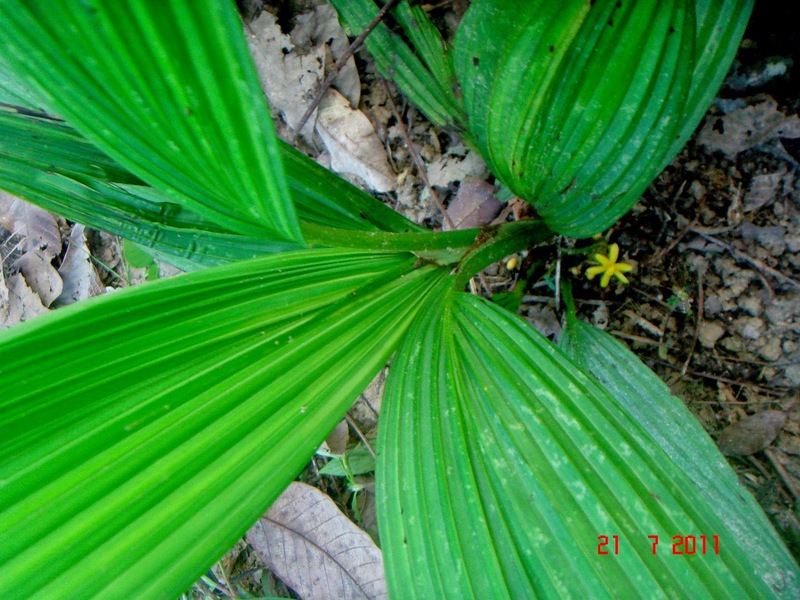 Lemba or hill coconut Curculigo latifolia (previously Molineria latifola), photographed by Ahmad Fuad Morad. Recent authors have recognised up to ten genera within the Hypoxidaceae, but a phylogenetic analysis of the family by Kocyan et al. (2011) lead them to suggest the reduction of that number to four or six, depending on how one might chose to deal with the position of Hypoxidia. This is a distinctive genus of two species found on the Seychelles. Flowers of Hypoxidia are a dark red-brown colour, and in contrast to the weak scent of other Hypoxidaceae they have a strong foetid odour that attracts flies as pollinators. Kocyan et al. 's phylogenetic analysis placed Hypoxidia as sister to the other species of Hypoxidaceae found on the Seychelles, Curculigo seychellensis, and the two together were placed as sister to a clade containing the remaining species of Curculigo (as well as species of Molineria, which Kocyan et al. suggested be synonymised with Curculigo). Curculigo species bear their flowers at the base of the plant; the ovary is actually found beneath the ground, with the corolla borne above the ground on an elongate tubular rostrum. This rostrum is particularly long in C. seychellensis, up to 12 cm. Curculigo seychellensis also has bifurcated leaves that make it look superficially like a palm seedling. It remains to be settled whether future authors will prefer to place C. seychellensis in its own new genus, or to sink Hypoxidia into Curculigo. Pauridia capensis (previously Spiloxene capensis), photographed by Bob Rutemoeller. The remaining Hypoxidaceae can be divided between the genera Hypoxis (containing Rhodohypoxis as a junior synonym), Empodium and Pauridia (containing Spiloxene and Saniella as synonyms, as well as some Australian species previously placed in Hypoxis). Members of the genera Empodium and Pauridia produce annual corms, while Hypoxis species have tuberous rhizomes. Empodium and Pauridia differ in features of the flowers and seeds (Kocyan et al. 2011). The two African Pauridia species previously classified as Saniella resemble Curculigo in having subterranean ovaries. It is perhaps unfortunate that the name Pauridia, previously restricted to two particularly small African species only a couple of centimetres in height, takes priority over Spiloxene, previously used for a larger group of about thirty species. But such are the vagaries of nomenclature, and that which we now call Pauridia capensis (Snijman & Kocyan 2013) will smell as... generally indifferent, actually, but it at least looks pretty specky. Kocyan, A., D. A. Snijman, F. Forest, D. S. Devey, J. V. Freudenstein, J. Wiland-Szymańska, M. W. Chase & P. J. Rudall. 2011. Molecular phylogenetics of Hypoxidaceae—evidence from plastid DNA data and inferences on morphology and biogeography. Molecular Phylogenetics and Evolution 60 (1): 122-136. Snijman, D. A., & A. Kocyan. 2013. The genus Pauridia (Hypoxidaceae) amplified to include Hypoxis sect. Ianthe, Saniella and Spiloxene, with revised nomenclature and typification. Phytotaxa 116 (1): 19-33. Normally I would delete this comment for obvious shilling of a dubious product, but I decided to leave it in place because it does at least relate to something referred to in the original post. I will simply remind readers that the efficacy of the product concerned has not yet been established, and that the emptor should never forget his caveat.